Your daily, at-home vacation awaits! 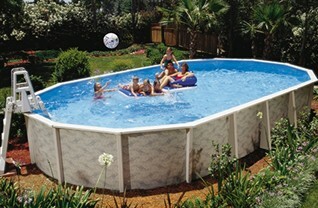 Above ground and in-ground pools create fun and relaxing family time like nothing else. From carefree days in the summer sun to tranquil, glimmering nights, a backyard pool brings everyone together for the perfect escape from busy days. We invite you to jump right in! Browse the above-ground pools from leading brands, or start planning your in-ground pool oasis right here. Start with our Buyer's Guide, and then ask the experts at Zagers to help you choose the perfect swimming pool at the perfect price! Browse our outdoor pool showcases for a side-by-side comparison of pools. Visit any of Zagers’ 5 West Michigan locations, in Jamestown, Holland, Wyoming, Northeast Grand Rapids, and Southeast Grand Rapids. A large selection of above ground pools from Doughboy and Sharkline are on display, with all the pool accessories and supplies to make them sparkle! Create a new centerpiece of summer with a dazzling in-ground pool! We’ll happily come to your home for a personal consultation and price quote. 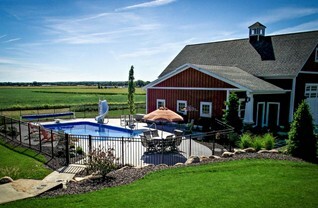 Or stop in to any of Zagers 5 locations to talk with an in-ground pool consultant for fresh ideas and the latest options. Our Pool Buyer’s Guide helps you choose the perfect pool, at the perfect price! What shape will work best there? How active will the pool be? Talk with an Expert Pool Professional Today! The friendly experts at Zagers Pool and Spa will help you every step of the way. From choosing the right swimming pool, to installing it and treating the water to sparkling perfection! Stop in to any of our 5 Locations, call us, or email anytime!